Dover is a classic location for fossil finding. Fossils are found in the chalk and flint casts. Dover has a great scenery and it is hard that one is not impressed by the stretch of coastline. The terrain is difficult to climb although it did have a dramatic set of stairs which is not been used now. The White Cliffs of Dover is considered a symbol of British heritage and it stretches along the south eastern coast of England. The Dover cliffs have protected the area from sea invasions. These fossils came up at a time when earth was covered with flood and during the middle and late parts during the flood, sedimentary rock layers were laid down with fossils. The cliffs take a white colour as it is made of calcium carbonate and it has shells of microscopic creatures which has got buried during the flood. More accessible are the chalk beds found along the coast of Dorset Coast, which is located further down in the English Channel coast in South West England. There are large ammonite and other shell fossils which could be found in the chalk. There are also other sedimentary layers which are filled with marine fossils. The chalk beds of Dover are made of calcium carbonate, which is a form of limestone containing over trillions of fossilised microbes. As per the evolutionists the chalk formation happened over millions of years with a very slow accumulation occurring yearly. The calcium rich shells accumulate at the bottom of the ocean floor. Faster accumulation could occur under the right conditions like increased temperature and nutrients from volcanic waters. The Dorset Coast is also good for the fossil hunter. 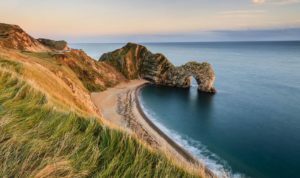 It is found further down the English Channel and one is able to find more chalk beds and other sedimentary layers along the Dorset Coast. 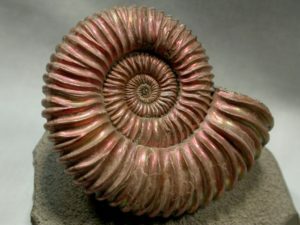 The walking trails which are present give the access to the large ammonite and shell fossils. The white cliffs of Dover, have however turned out to be a place where precautions should be taken for climbing. The area Crab Bay between the Langdon Cliffs and Foreland Lighthouse fell into the sea as a result of water soaking through the porous chalk and then freezing and cracking the rock of the face of the cliff. It is also seen that algae grows in areas of the surface of the chalk cliffs. The cliff collapses are been studied and the best time to collect fossils is prior to the sea erodes the rockfalls. The fossil hunters with less experience should seek advice prior to approaching a recent cliff face.